Soleá is a 12 beat rhythm with accents of counts 3, 6, 8, 10 and 12. As Manuel plays the compás of soleá with his guitar José demonstrates one example pattern of palmas for soleá. This is one of the patterns that José uses. There are many possible variations and as you study you will develop your sense of the palmas that you need to employ when accompanying the guitar (as José is here), a dancer or cante. 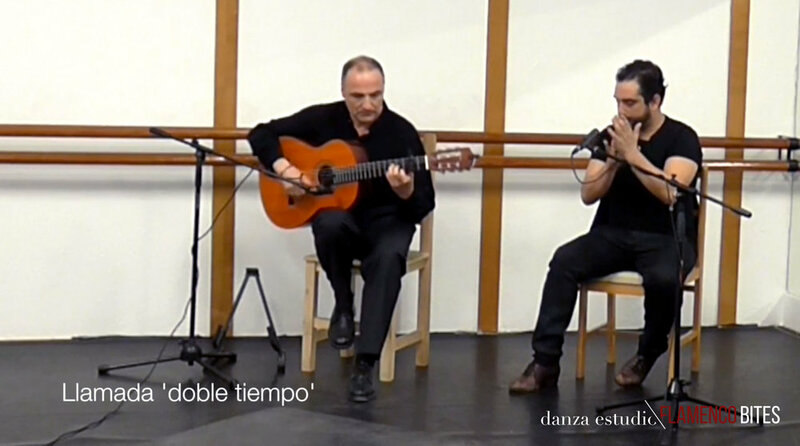 This video is an excerpt from our class 'El compás y el toque para baile' and is available to all members of danza estudio Flamenco Bites. We explore the rhythm of the palo and in particular the melodies of the guitar for different parts of a baile por soleá such as the llamada, marcaje and the escobilla. With this class you can start to develop your sense of the guitar and learn how it relates to different types of steps demonstrated by maestro José Merino. To enrol and start studying straight away click here.